Beyond the limitation of this material world is the spiritual sky, paravyoma, which has many spiritual planets, the supreme of which is called Krishnaloka. Krishnaloka, the abode of Krishna, has three divisions, which are known as Dvaraka, Mathura, and Gokula. In that abode the Personality of Godhead expands Himself into four plenary portions--Krishna, Balarama, Pradyumna (the transcendental Cupid) and Aniruddha. They are known as the original quadruple forms. In Krishnaloka is a transcendental place known as Svetadvipa. Below Krishnaloka in the spiritual sky are the Vaikuntha planets. 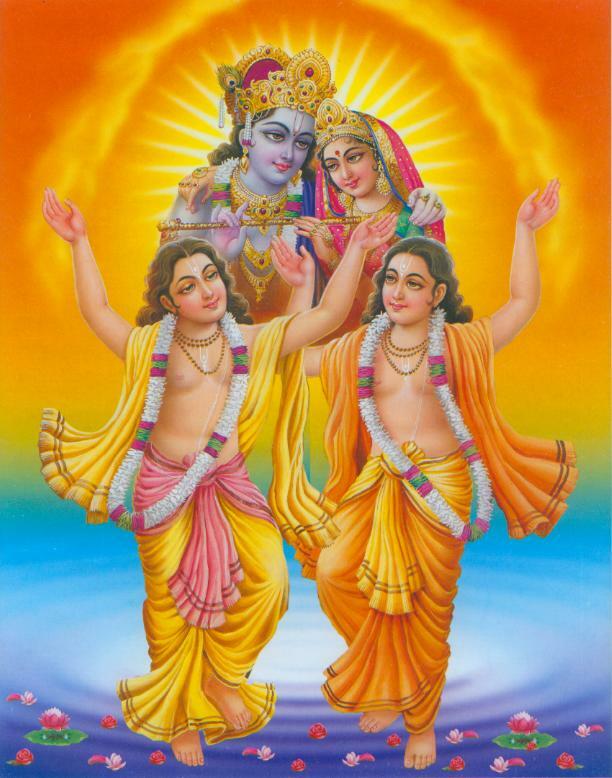 On each Vaikuntha planet a four-handed form of Lord Narayana is present, each one expanded from the first quadruple manifestation, as described above. The Personality of Godhead known as Sri Balarama in Krishnaloka is the original Sankarshan (attracting Deity), and from this Sankarshan expands another Sankarshan, called Maha-sankarshan, who resides in one of the Vaikuntha planets. By His internal potency, Maha-sankarshan maintains the transcendental existence of all the planets in the spiritual sky, where all the living beings are eternally liberated souls. The influence of the material energy is conspicuous there by its absence. On those planets the second quadruple manifestation is present. Outside of the Vaikuntha planets is the impersonal manifestation of Sri Krishna, which is known as Brahmaloka, or the great Brahman, which is described as the effulgence of the Lord’s supremely spiritual body. On the other side of Brahmaloka is the spiritual karana-samudra, or Causal Ocean. The material energy exists on the other side of that Causal Ocean, without touching it. In the Causal Ocean is Maha-Vishnu, the original purusha expansion from Sankarshan. Maha-Vishnu places His glance over the material energy, and by a reflection of His transcendental body He amalgamates Himself within the material elements. As the source of the material elements, the material energy is known as pradhana, and as the source of the manifestations of the material energy it is known as maya, the Lord’s external or illusory energy. But material nature is inert in that she has no independent power to do anything. She is empowered to make the cosmic manifestation by the glance of Maha-Vishnu. Therefore, the material energy is not the original cause of the material manifestation. Rather, the transcendental glance of Maha-Vishnu over material nature is what produces that cosmic manifestation. Maha-Vishnu again enters every universe as the reservoir of all living entities, and becomes Garbhodakashayi Vishnu. From Garbhodakashayi Vishnu comes Kshirodakashayi Vishnu, who is the expansion of the Supersoul of every living entity. Garbhodakashayi Vishnu also has His own Vaikuntha planet (spiritual residence) in every universe, where He lives as the Supersoul (Kshirodakashayi Vishnu) or supreme controller of the universe. Garbhodakashayi Vishnu reclines in the midst of the watery portion of the universe and generates the first living creature of the universe, Brahma. The imaginary universal form is a partial manifestation of Garbhodakashayi Vishnu. On the Vaikuntha planet in every universe is an ocean of milk, and within that ocean is an island called Svetadvepa, where Lord Vishnu lives. In this way, there are two Svetadvepas (spiritual abodes of Lord Vishnu)--one in the abode of Krishna on Krishnaloka in the spiritual realm, and the other in the ocean of milk on the Vaikuntha or spiritual planet in every universe. The Svetadvepa in the abode of Krishna is identical with Vrindavana-dhama, which is the sacred place where Krishna Himself appears to display His loving pastimes. In the Svetadvepa within every universe is a Sesha form of Godhead, which is another aspect of Lord Balarama, who expands in numerous ways to serve as the Lord’s support, and serves Lord Vishnu by assuming the form of His umbrella, slippers, couch, pillows, garments, residence, sacred thread, throne, and so on. Nityananda Prabhu is an expansion of the same Lord Baladeva in Krishnaloka. Therefore, Nityananda Prabhu is the original Sankarshan, and Maha-sankarshan and His expansions as the purushas in the universes are plenary expansions of Nityananda Prabhu. Sri Nityananda is the personification of the love that originated in Lord Sri Caitanya. He was among the foremost of the league of illustrious men who had deepest sympathy and love for humanity. He helped people cross the barrier of color, creed, caste privilege, and united them with the knowledge that all are the children of the Divine. He had spontaneous love for each and everybody. He never discriminated while providing benevolence, even to thieves and dacoits. He never did demand from others, but inspired them through His generosity. The world will become a better place when we imbibe the spirit of Nityananda. Sri Nityananda was born to a pious brahmana family. His father was Hadai Ojha and mother Padmavati. He also had a brother named Banka Raya. He appeared here in the second half of the 15th century, around 20 years before the appearance of Sri Caitanya Mahaprabhu. Sri Nityananda was born on Shukia Trayodashi, in the month of Magha, in the year 1473, 12th of February (Shakabda Era - 1395). Just before the advent of Sri Nityananda a sage came to the home of Padmavati, mother of Nityananda. Upon seeing her, he started dancing and saying repeatedly “This is the womb”. The stranger was Garga Muni in disguise. He predicted the arrival of Balarama on earth as Sri Nityananda. He emphasized that Padmavati was the reincarnation of Rohini (mother of Balarama), and that she cradled in her womb Balarama, the other self of Nityananda. He predicted the descent of Nityananda in the month of Magh, on Sukia Trayodashi. Saying this, Garga Muni disappeared. In this connection, one can remember that it was this Garga Muni who revealed the name of Balarama and Krishna in the Court of Nanda so many years before, as described in the Srimad-Bhagavatam. Ekachakra is the birth place of Sri Sri Nityananda Mahaprabhu. Ekachakra, combined with Birchandrapur, has a population of only about 4,000. It is an obscure village of Bengal, tucked away in a remote corner. It is located about 4 hours (165 km, or 100 miles) north of Mayapur, reached by bus or taxi. It is 11 miles north of the town of Rampur Hat, and 8 miles east of Mallarapura railway station. The village is about ten minutes walk from the Birchandrapur bus stop if you take a government bus. You can arrange the best means of going there with the help of the Mayapur temple offices. Such people as Ishan Nagar in his book Adwaita Prakasha, Narahari Chakravarty in Bhakti Ratnakara, Nityananda Das in Prema Vilasa, Vrindavana Das in Sri Chaitanya Bhagavata, and others have glorified the place in their writings. But the significance of it is not widely known. It is a very simple town with few amenities to offer. There is hardly any place to buy even such things as cold drinks or bottled water. Of course, that could change in the future. To see the sites of Ekachakra, as you reach the central part of the village, or the road that divides Ekachakra and Birchandrapur, you will see an arch. This indicates the entrance to the road that leads to Nityananda Janmasthan, or the birthplace of Sri Nityananda, also called Garbhavasa. The village is very simple and has no facilities for travelers and pilgrims. That will change soon as the Iskcon temple has constructed a nice new temple and guesthouse. This will help support more pilgrims who do want to come for a visit, and allow them to stay in this peaceful village and absorb the spiritual atmosphere. As we walk under the arch and down the road, we can see the simplicity of the homes and people here. We soon come to the small temple of Kadam Khandi on the left. This marks the place where Lord Nityananda recovered the Bankim Raya deity from the Yamuna River. The temple presently has a nice image of Sadbhuja, the form of the Lord in a combination of Rama, Krishna, and Sri Caitanya. Further back is an altar that has small deities of Krishna and Balarama, and larger deities of Sri Nityananda and Sri Caitanya (Gaura Nitai). Behind the temple is the Yamuna River, also called the Maudesvara River. This used to be much bigger, but is now like a little creek. On the bank is the Kadam Khandi Ghat where the Krishna deity of Bankim Raya was found. As we make our way farther down the road, we come to the Iskcon temple, set in a very nice location. In front is the small and temporary temple with Gaura Nitai deities. Behind that is the guest house, and in the open field nearby is the place where the new and larger temple will be. The devotees here are working hard to make the new temple a reality. One of the devotees can also take you around the town to see the most important places. As we take the road farther along, on the right we soon come to the Kundu Kund, a nice pond where Sri Nityananda used to bathe. A little farther down the road we come to the Garbhavasa, or the Sri Nityananda Janmasthan, His birthplace. In front is the temple building with some offices. Then we see the kirtana hall in front of the main altars. The central and main altar has the middle deity of Sri Nityananda with Lord Caitanya on the right with a raised arm, and Sri Advaita on the left. The altar on the right side has deities of Sri Sri Radha-Radhakanta and Radha-Srikanta, a larger dancing Gauranga in the center, and ten brass sakhis, girl servants, on the bottom step. It is wonderful to sit and engage in chanting japa or singing kirtanas in the hall. Behind the main temple you can see the new temple that they are building here, which should be done in a few years after the time of this writing. It will be several floors high and hold a beautiful temple and large kirtana hall for groups to engage in the congregational chanting of the holy names. As we leave the hall, across from it we see the Hadai Pandita Bhavan which marks the place where the house once stood of Nityananda’s father, who is also called Mukunda Bandyopadhyaya as well as Hadai Pandit. 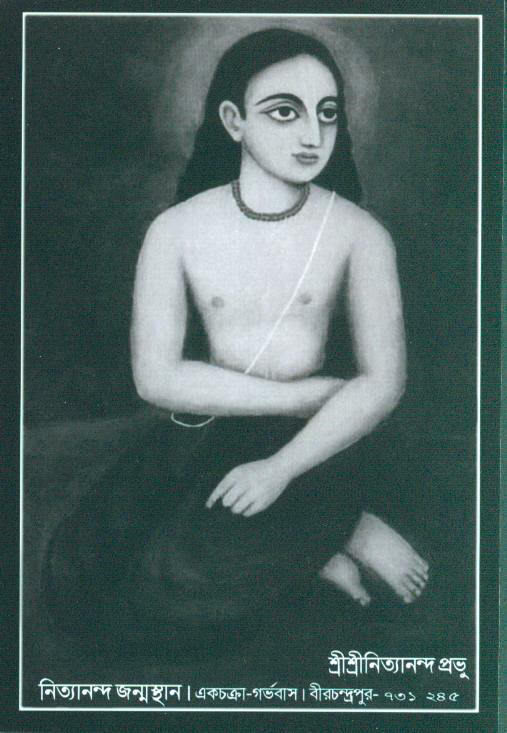 Nityananda was the first of six other sons of Hadai Pandit. As we go to our left from the Hadai Pandita Bhavan, we see a very small white temple, which is the exact spot where Lord Nityananda was born. Inside is a deity of Lord Nityananda. This is also called a maternity temple, or “Sutika Mandir.” Janhava Devi, wife of Lord Nityananda, Herself selected Madhab Bandyopadhyay and Raghav Pandit as the first and second custodian to look after the holy place. Close by on the left are two banyan trees that date back to the time of Lord Nityananda. Pilgrims always circumambulate the temple and trees. On the other side of the small temple is Nitai Kund, a pool where such things as the clothes, plates, etc., of Lord Nityananda were washed, and where He had also bathed. Embedded in its core and not visible to the naked eye is another tank named Ananga Kund. A beautiful Shiva linga and a lot of utensils were found while digging the tank. Next to this kund is an old pippala tree surrounded by a cement platform. This is called Mala Tala (beads tree) for a number of reasons. First, just before Nityananda left home with the sannyasi who had requested His father that he let Nityananda travel with him, Hadai Pandita chanted there, but then also left his beads under the tree due to forgetfulness caused by anxiety when Nityananda was leaving. Many years later Sri Caitanya also visited Ekachakra and left His flower garland on a branch of this tree. He was then in a transcendental stage of consciousness, quite oblivious of the mundane condition of the world. He came here with the earnest longing to meet Krishna. He removed His own garland and deposited it with the tree. This place is also called Sanyasitala. This is because Sri Ishwarapuri, who initiated Sri Caitanya, once took rest under the same tree. According to Prema Vilas, Ishwarapuri begged to Nityananda’s father to hand over his son to him. Then the place was named after the Sannyasi Ishwarapuri as Sanyasitala. Behind the complex of the Garbhavasa is Padmavati Kund, also called Padamavati Pushkarini. This was dug by Sri Nityananda’s grandfather for his daughter, Padmavati. A little ways farther down the road we find a small deteriorated platform of bricks with a Bakula tree over it. The red blossoms fall all around it. This is where the original bakula tree once stood and where Nityananda and his friends would come to play, perform episodes of the Ramayana, or even have philosophical discussions. The original tree had branches that took the shape of cobra hoods due to the touch of Sri Nityananda. This area was once the estate of Hadai Pandita, and under the original tree was where Nityananda’s umbilical cord was buried. As we walk farther, on the right we see the place known as Hantugada, or Jahnu Kund. It is a small kund with a lone tree hanging over it. This is where Sri Nityananda would perform the Dadhi-cida festival and distribute chipped rice and yogurt. He would also kneel down while taking His own prasada. For the benefit of the residents, He also called all the sacred rivers into this kund so that they could all bathe here without the need to travel to all of the holy places, like the Ganga River, to get a sacred bath. Farther in the fields, about 400 meters out, there is the place known as Pandava Tala. Keli-kadamba trees are around it. This is where the Pandavas once lived with their mother, Kunti, while they were exiled in the forest. This is in connection with another place called Sikhandabi, which was the residence of the Bakasura demon who terrorized the local residents by eating one person every day. This went on until Queen Kunti asked super strong Bhima to kill the demon, which he did after a fierce fight. The Birchandrapur side of town can now be seen after seeing all of the above places. We make our way back down the road to the arch where we originally started. From there we go to the left and then make a quick right, and straight down the street through the houses we shortly arrive at the Bankim Raya temple. This temple was established by Nityananda’s son, Virabhadra Gosai, to house Bankim Raya, the deity that Sri Nityananda had found when He returned to Ekachakra after being absent for 30 years. When you get up to the altar you will see the small Krishna deity in the center with Srimati Radharani on His left and Jahnava Devi on His right. It is said that Lord Nityananda left this world by entering into this Krishna deity. There is also a deity of Yogamaya on a separate throne to the right. The Radharani deity was also found in Bhaddhapur about ½ mile to the west in the region of Birchandrapur. After that She was installed with Bankim Raya and called Bhaddhapurera, the mistress of Bhaddhapura. Outside the temple gate is another little temple for Lord Krishna as Madana Mohana, with Radha on His left and Chandravali on His right. Farther right are the deities of Sri Sri Radha-Vrindavana Chandra. The priest of this temple, who says his family has been worshiping these deities for 450 years, says he is a descendant of Nityananda. Next is a nice little temple dedicated to Lord Jagannatha, Lord Balarama and Lady Subhadra along with Sakshi Gopal. After that we come to a small Shiva shrine for Ekachakra Mahadeva, Shiva or Bhandisvara, who was worshiped by Hadai Pandita. The Sveta Ganga is a small kund near the Bankim Raya temple, and right across from the Jagannatha temple. This is said to have been dug by 1200 shaktas (worshipers of the Divine Mother) of the Nedadi sect who had approached the wife of Lord Nityananda, Jahnava Mata, to check her power. A few other noted places include the Radha Kund (Raya Pukur) and Syama Kund (Syama Pukur) in the fields west of Birchandrapur, and a small mound known as Govardhana Hill some distance south of the Bankim Raya temple. As you are walking around you will also see the occasional vendor of Nityananda and Caitanya deities that are made from nima wood in the typical local fashion. You can dive deeper into the history of Ekachakra and the pastimes that took place here by reading more about them. Another book that can help guide you around the village and elaborate its history can be purchased at the Garbhavasa temple. To find out more about Lord Nityananda's pastimes, you can read some of His biography and stories of His life by clicking on Nityananda Prabhu. And to read the descriptions of His glories in the prayers composed about Him, click here: Prayers to Lord Caitanya and Lord Nityananda.